Melt margarine in large skillet over medium heat. Add onions; cook and stir until golden brown. Add sauerkraut; cook 5 to 8 minutes or until sauerkraut is lightly browned, stirring occasionally. Add pork chops, bell pepper, water, salt and pepper. Cover; cook over medium-low heat for 10 minutes or until pork chops are thoroughly heated. 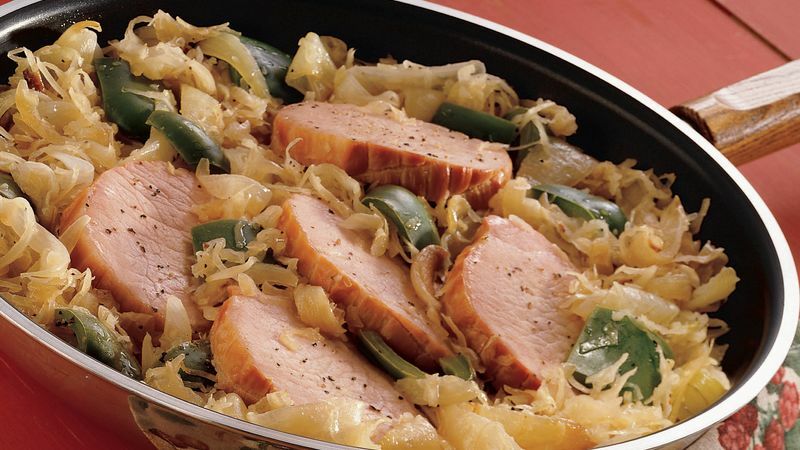 Give the pork a European touch by adding a teaspoon of caraway seed or dill seed to the skillet. The green bell pepper gives this recipe a bit of color. Kick up the color quotient further by garnishing plates with sprigs of curly parsley, tomato slices or baby carrots.